16.Dixon-Woods M, Bosk CL, Aveling EL, et al. Explaining Michigan: developing an ex post theory of a quality improvement program. Milbank Q 2011;89(2):167-205. 17.Bredgaard T. Evaluering af offentlig politik og administration. København: Hans Reitzel; 2016. 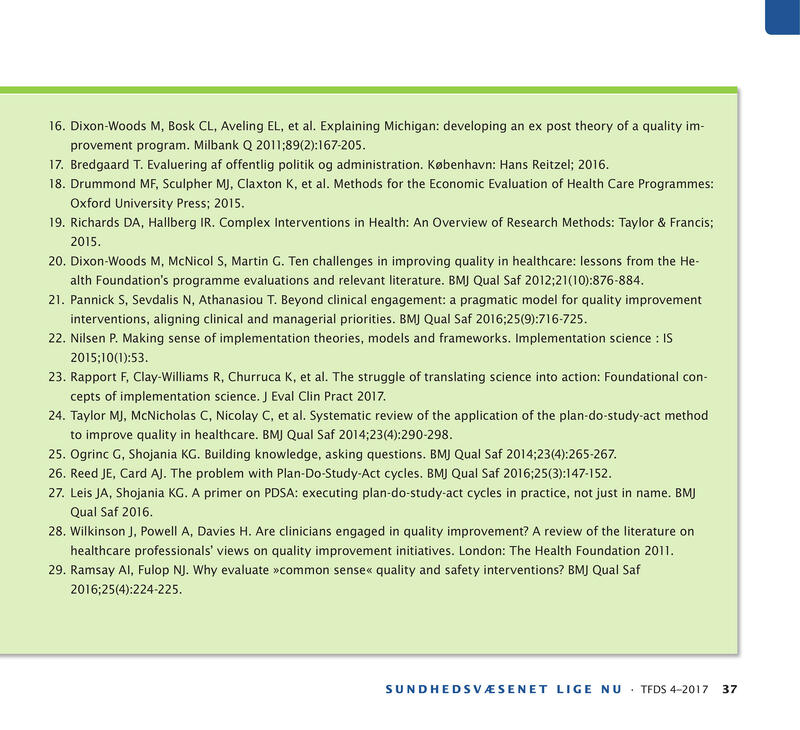 20.Dixon-Woods M, McNicol S, Martin G. Ten challenges in improving quality in healthcare: lessons from the Health Foundation’s programme evaluations and relevant literature. BMJ Qual Saf 2012;21(10):876-884.
interventions, aligning clinical and managerial priorities. BMJ Qual Saf 2016;25(9):716-725. 23.Rapport F, Clay-Williams R, Churruca K, et al. The struggle of translating science into action: Foundational concepts of implementation science. J Eval Clin Pract 2017.
to improve quality in healthcare. BMJ Qual Saf 2014;23(4):290-298. 25.Ogrinc G, Shojania KG. Building knowledge, asking questions. BMJ Qual Saf 2014;23(4):265-267. 26. Reed JE, Card AJ. The problem with Plan-Do-Study-Act cycles. BMJ Qual Saf 2016;25(3):147-152.
healthcare professionals’ views on quality improvement initiatives. London: The Health Foundation 2011.